June 25th, 2018 | Press Releases, News. 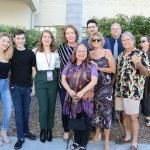 (Bradenton, FL—June 21, 2018) Manatee Technical College graduated 272 students from its main campus on June 20 and 21. The college held two ceremonies to accommodate the number of graduates and their guests in Cantrell Hall. 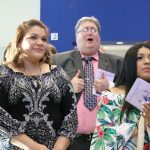 On June 20, MTC graduated 126 students from 15 career certificate programs in the areas of Arts, A/V Technology, Communication, Business Management and Administration, Information Technology, and Salon Services. On June 21, MTC graduated 146 students from 18 career certificate programs in the areas of Architecture and Construction, Education and Training, Hospitality and Tourism, Manufacturing, and Transportation, Distribution and Logistics. Carla Austin, graduating from the digital design program, gave the graduation speech (attached) on June 20. Austin was a stay-at-home mom before coming to MTC. She holds a Bachelor degree from FSU, is a mother of four children ages 11-18, and she just celebrated 20 years of marriage. “Coming to MTC was the best decision I could have made,” she said. Austin plans to do graphic design or author and illustrate children’s books, one of which she did for her final class project. June 21 had two speakers: Brandon Armstrong, graduating from marine service technology, and Ian Weir, graduating from welding technology. The 33-year-old Armstrong told a story of being diagnosed with cancer when he was only 19, and he was told he would never be able to father a child. He beat the cancer, but in the process of treatment, he became addicted to pain medication. After 10 years of bad choices and doing 5 years in prison, his mom encouraged him to enroll in MTC’s Marine Technology program. He said, “MTC changed my life. They didn’t judge me. The staff and teachers were friendly and helpful.” He is now a graduate, employed at Chris-Craft, reconnected with his first love, and expecting his first child on Monday. The graduates jumped to their feet in a standing ovation. He ended by focusing on his fellow graduates. Weir also received a standing ovation. Other students involved in the ceremony were Medical coder/biller ATD graduate Hadassah McClendon and commercial foods/culinary arts graduate Jovani Sillas who gave the Invocation on the 20th and 21st respectively. MTC director Dr. Valerie Viands officiated. 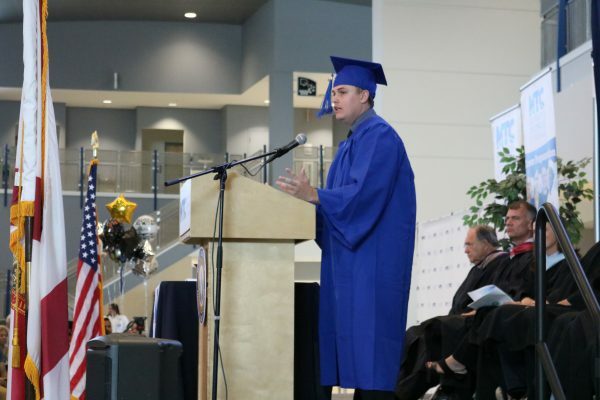 Joining her in addressing the graduates were Superintendent Dr. Diana Greene, School Board chair Dr. Scott Hopes, MTC Board of Governors chair John Ziemnicki, and District executive director of adult, career and technical education Doug Wagner. Also on stage were Deputy Superintendent Cynthia Saunders and School Board members John Colon and David Miner. Main Campus Assistant Director Dr. Jennifer Gilray led the audience in the Pledge of Allegiance. MTC Career Counselors Xela Brutus, Roderick Mitchell, Terri Parrish, and Savannah Work presented diplomas.